Landing at Kerikeri Airport? Your Gateway to the North. In Kerikeri, you can find warm weather, a relaxed lifestyle and a healthy economy full of opportunity and promise. Home to some of New Zealand’s oldest buildings, top tourist attractions, award winning wines, internationally acclaimed golf courses, beautiful coastal surroundings and a thriving art and craft following, makes it very easy to stay a little longer and very hard to leave at all. Maori welcomed missionaries to the Kerikeri Basin back in 1819 and so began New Zealand’s bi-cultural society. Kerikeri’s Kemp House (built circa 1821-22) and the iconic Stone Store (1832-36) play an important part in New Zealand’s history. Home to manufacturing, fishing, forestry, agriculture and government departments it’s no wonder there are four flights to Kerikeri Airport from Auckland Airport every work day. This gives businesses the opportunity to be in The Bay of Islands in under an hour making it convenient, accessible and simply good business sense. Many of our customers like that they can touch down at Kerikeri Airport knowing one of our rental cars will be waiting for them so they are ready to maximise their time in the Northland. Alternatively, if you need to make several stops along the way, simply pick up one of our vehicles at Auckland Airport and drive your way to Kerikeri via the Eastern arm of the Twin Coast Highway. Our different vehicle pick-up and drop-off points across Northland (Kerikeri Airport, Kerikeri, Paihia, Opua, Russell, Kaitaia, and Kaitaia Airport) offer customers great flexibility. Northland is home to two of NZ’s busiest ports of entry with 550 international arrivals in 2012, 460 of them in Opua and 90 in Whangarei. Between Christmas 2016 and April 2017 the Bay of Islands will see around 39 cruise ships in Opua– and this doesn’t include the super yachts. That’s a lot of people, and numbers like this have meant tourism growth in the Kerikeri area developing quality motels, lodges, bed and breakfasts, hostels etc. Many New Zealander holiday makers enter The Bay of Islands via the Marina in Opua – half an hour drive from Kerikeri. Recent development has increased the marina to 450 berths with full-service marine facilities, bringing in thousands of boaties and a boosted economy every Summer. Prone to the finer things in life, locals like their fresh food and are serious about their coffee. On Saturdays, the Old Packhouse Market is a great place to people-watch and wile away the hours sipping your coffee or locally grown orange juice listening to some homegrown entertainment. 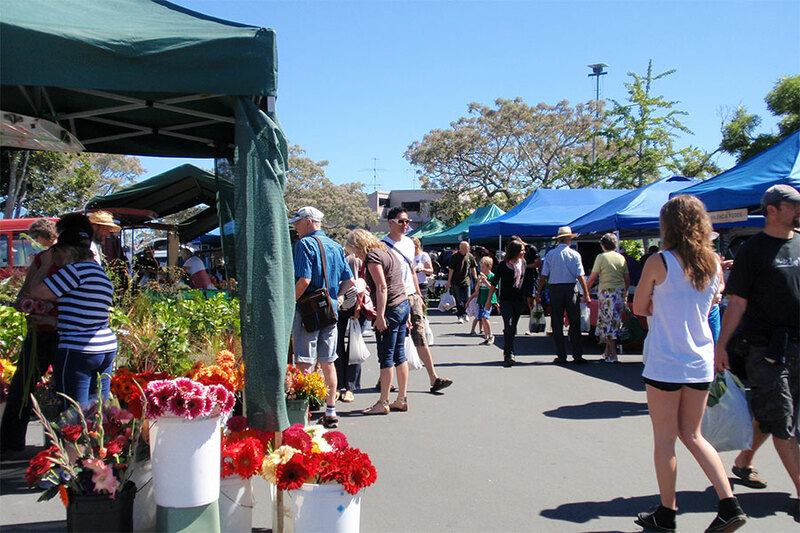 Fast forward to Sunday at the Farmers Market which has been offering produce from Northland growers and producers since 2004. Kerikeri is also littered with cafes and restaurants and vineyards such as Fat Pig Winery, or Marsden Estate offering onsite quality food to accompany those delicious wines. Once you’ve had your full of terrific food, there are some great spots in Kerikeri to walk, swim, run and cycle. Rainbow Falls is a big draw-card with an easy walking track (even with a pushchair) to the spectacular falls – a popular swimming hole and great for kayakers as well. Every Spring we see the Kerikeri half marathon bringing together around 2000 runners, walkers and wheelchair athletes. But of course, the “must do” sport for anyone new to the region is to just jump into the water. It’s the warmest you’ll find in the entire country so no excuses for not dipping your feet in! So if Kerikeri sounds like your kind of place, get packing and start booking.